7. Still in the shower...since the little shelf built into the shower wall is worse than useless, something had to be done. 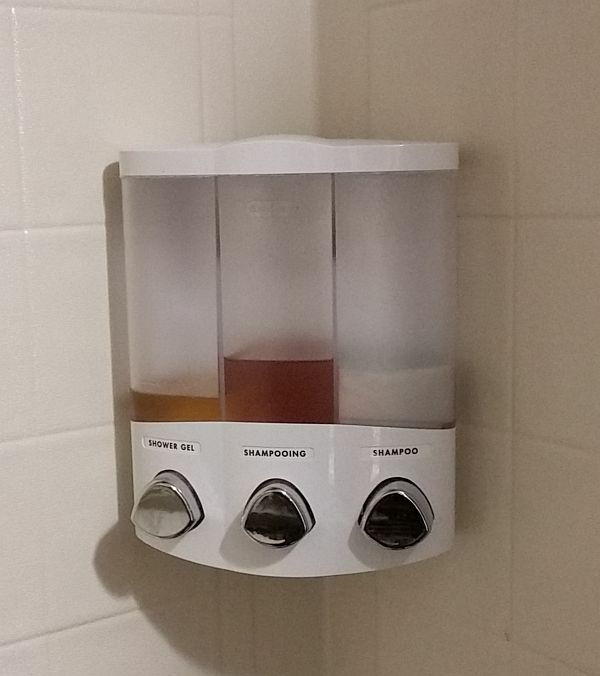 Picked up this 3 chamber soap/shampoo dispenser on Amazon Prime. It is made to fit in the corner, and comes with its' own adhesive. 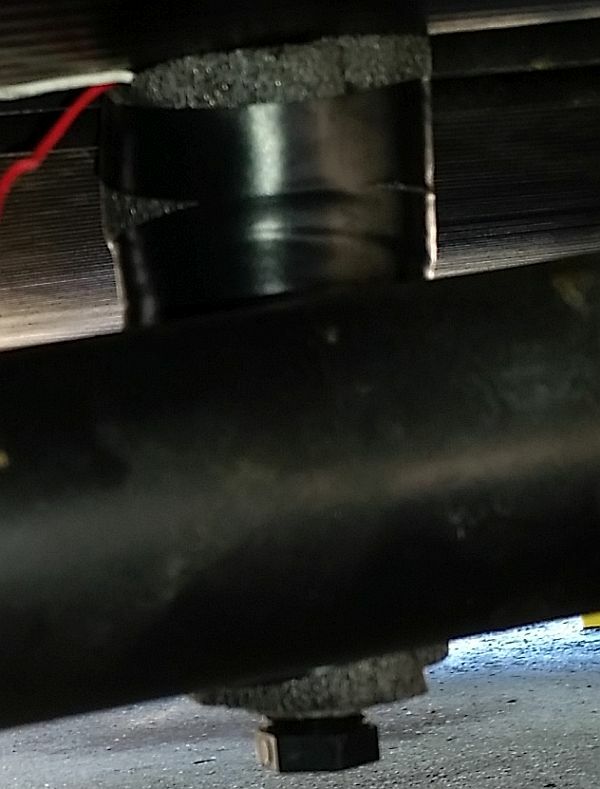 I was doubtful that it would stay in place with all the bouncing around on the road, especially with all 3 chambers filled, but it has held up fine so far. 8. 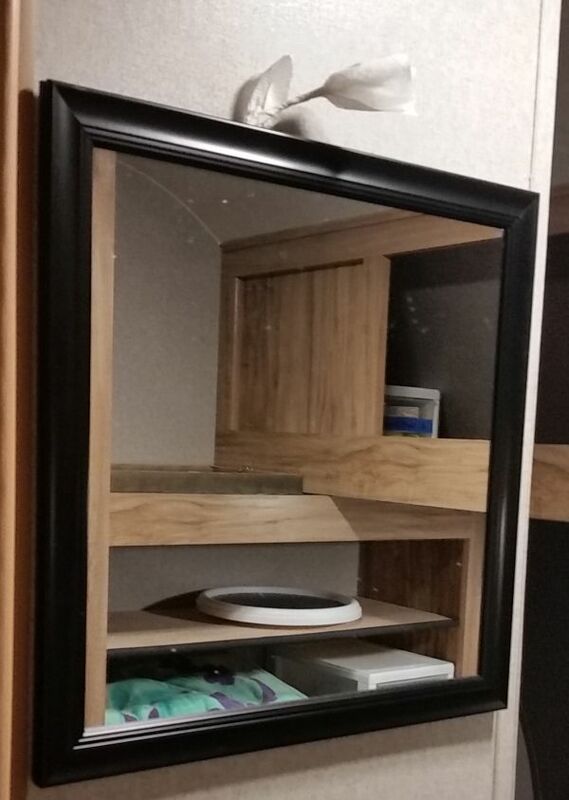 There is no mirror anywhere in the trailer. Mary searched for a long while to find one that was not too heavy, and would fit in some available wall space. She found this 16" x 16" and hung it on the wall right outside the bathroom. Perfect! 9. Another little convenience are two stools. 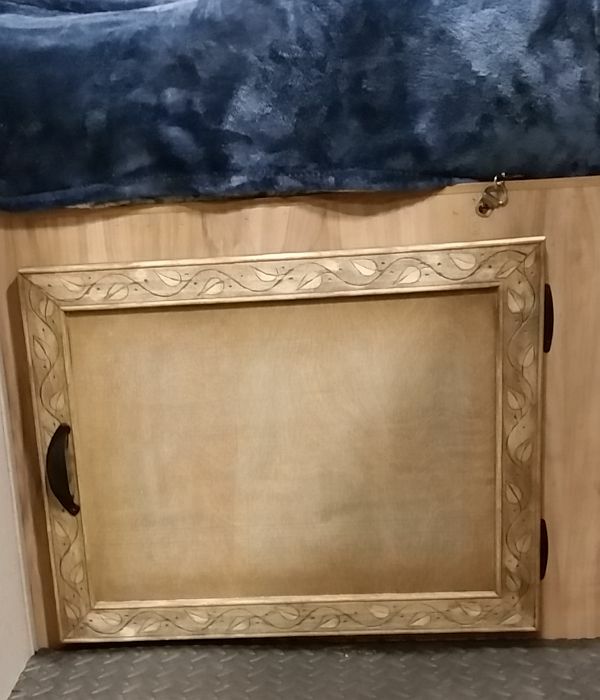 There is one fold-able couch/bed in the trailer. It can seat 3 people, 2 very comfortably. We wanted more options on seating. Not something you'd want to sit on all afternoon or evening, but if we have guests for a little while and want some extra seating, they have worked out well. 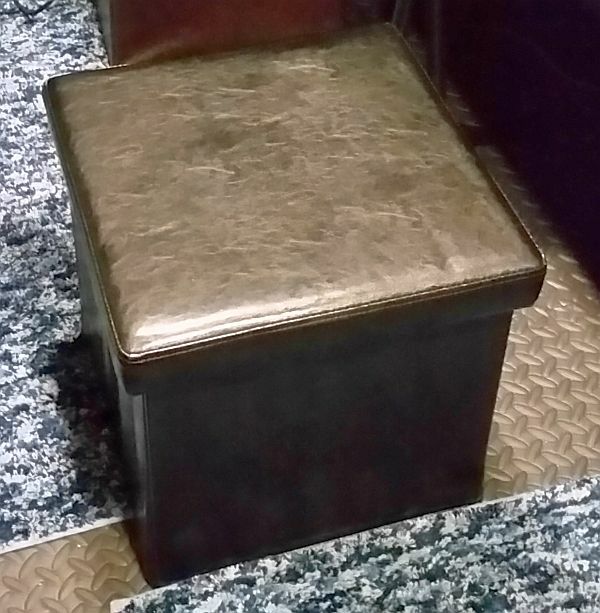 They also work very well as foot stools for Mary and I when sitting on the couch! 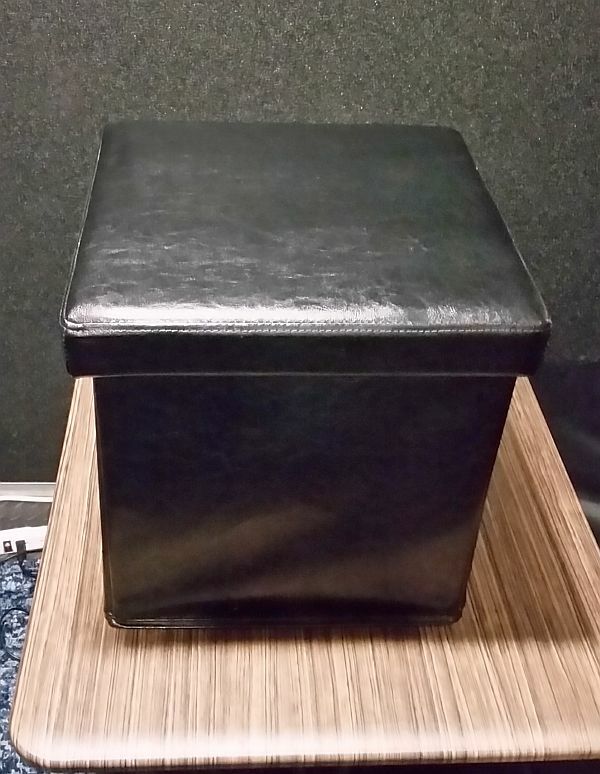 AND...they double as storage, the padded seat comes off and we have used one as a dirty clothes hamper and the other to store a variety of things. They also slide easily under the couch, out of the way. In less than 10 seconds they fold back out to a usable stool/storage container. 10-12. Pictured below is a paper towel holder, dish towel hook, and trash can. 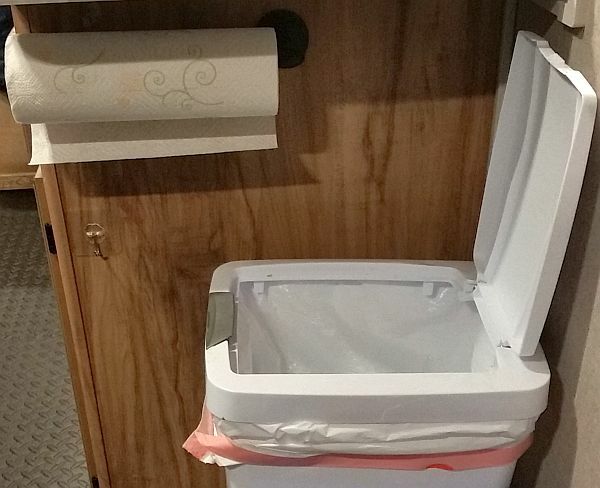 We tried out several locations for a paper towel holder...each location was convenient for the paper towel access, but interfered with access to something else. Finally settled on the side of the kitchen cabinet, right below the counter. 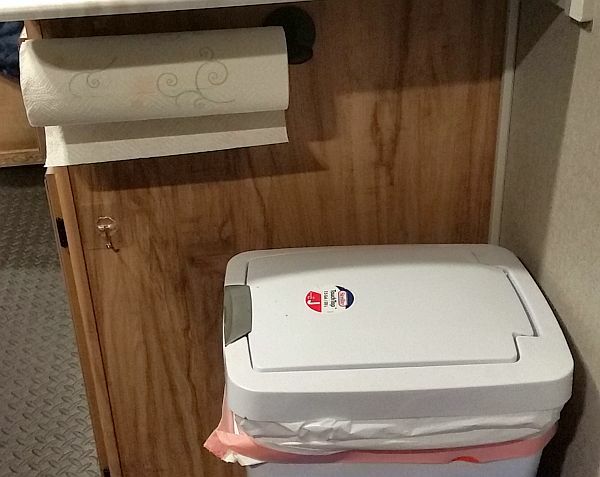 It was also a good location for a dish towel hook, and importantly let us get a trash can that would open and close without hitting the roll of paper towels. 13. At the head of the bed is a 110 outlet. I removed it and replaced it with a 110V outlet/dual USB port combo. I know it's crooked. I need to pull it back out and tweak the romex a bit so it will sit flush. 14. This next project was a big one, and took a while to figure out. We tossed around a lot of different ideas. 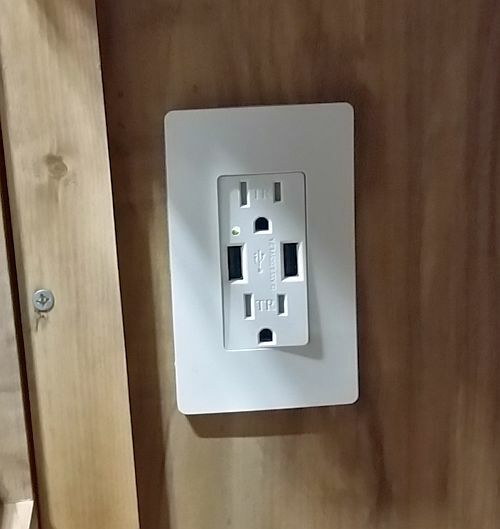 We needed more USB ports, and some 12v power point receptacles. 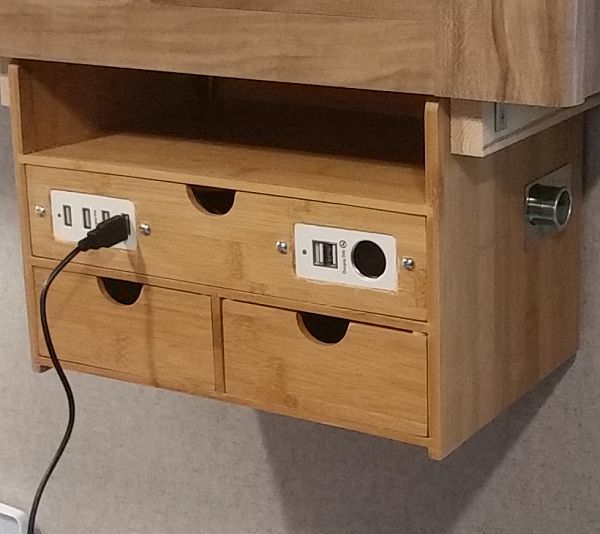 We also needed somewhere to keep USB cables while not in use, AND we need some where to set the devices while they were plugged into the USB ports getting recharged. And we wanted this "station" to be below the TV. We searched around quite a bit for something we could buy that did all this. We also looked for multiple components that we could buy, that together would do all the above. No luck. So we decided to build our own. We purchased a Sorbus 3-Tier Bamboo Shelf Organizer for Desk with Drawers. We also purchased a 4 port USB, a dual port USB with 12v receptacle and a stand alone 12v receptacle. We then installed all three receptacle units in the top drawer of the organizer, hiding all the wires in that top drawer. This left us the top shelf to set things (phones, etc.) 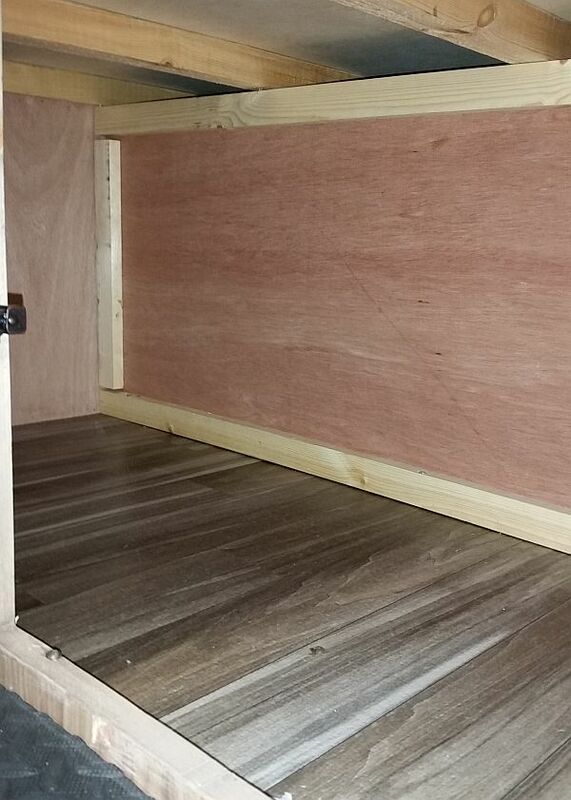 on, and the bottom two drawers to store wires in. We used self-adhesive felt pads on the drawers to keep them from sliding open while going down the road. 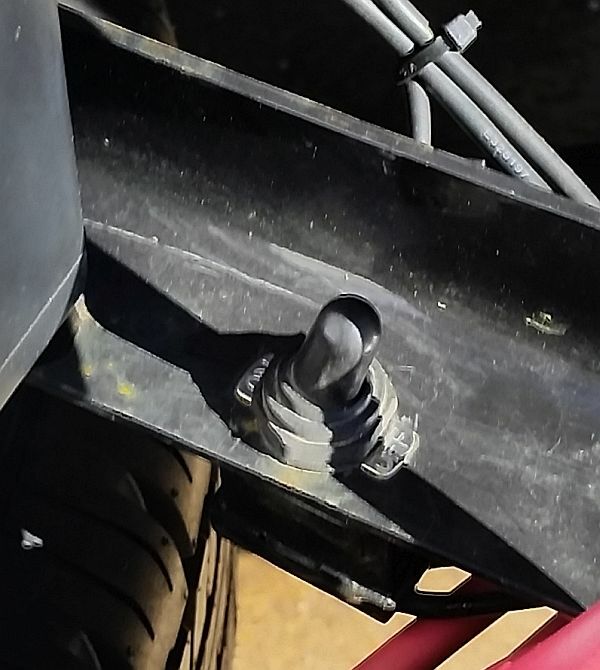 Works perfectly, they open easily when pulling on them, but stay closed otherwise. We then secured the entire power station to the bottom of the TV cabinet with some 1x1.5 and some L brackets on either side and the back. This as worked extremely well and is very convenient. I will get some pics of the wiring to the fuse box and post that up soon. More to come as I take more photos and have time to post. Great job on the USB fixture!! Again, nice work! I like your wonderful ideas. Going to use some myself! The USB thing is awesome. Now, What would you like done? Nice job on your mods! As you have found out once you start it's hard to stop . Thank you! Yeah, we are really happy with how it turned out. It gets a lot of use, and is very convenient. Thank you. Yes, it is a sickness. 15. One other thing in the shower...the soap we normally use takes a lot of water to rinse off. Being aware of fresh tank and gray tank limitations, Mary did some research and found some Castile soap. It cleans well, and rinses off easily. We like it so much we have switched to it at home also. 16. Being as I still work, even while on the road, maintaining an internet connection is important for me. There are some places that my cell signal (for hotspot) is not strong enough. I purchased the weBoost Drive Sleek 470135 Cell Phone Signal Booster and a Wilson Electronics 311125 Dual-Band Magnet Mount Cellular Antenna to use for those times when I need some extra signal. I put a velcro patch on the back corner of the roof, and when needed I just slip the antenna out the back door and onto the velcro. It's there when we need it, and completely out of the way the rest of the time. 17. 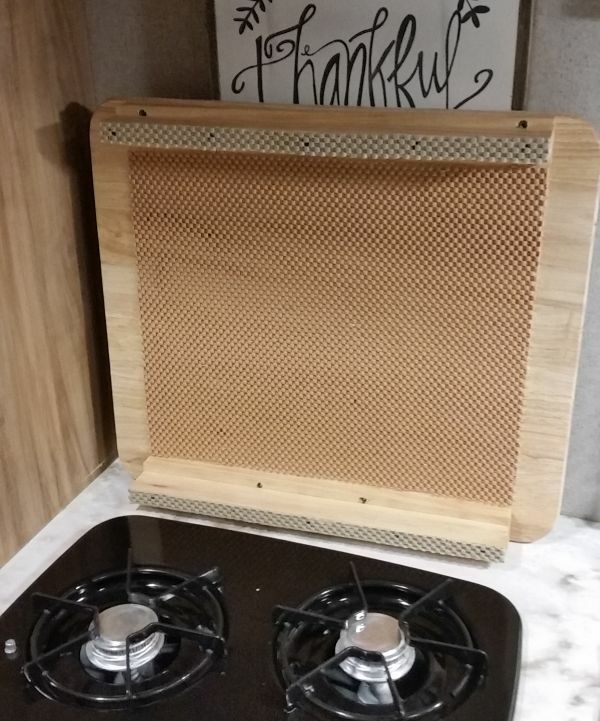 We purchased a cutting board to give more counter space when not using the stove. There were no legs to hold it over the burners, so we made them some. Added some non-slip material to them. Works great! 18 & 19. 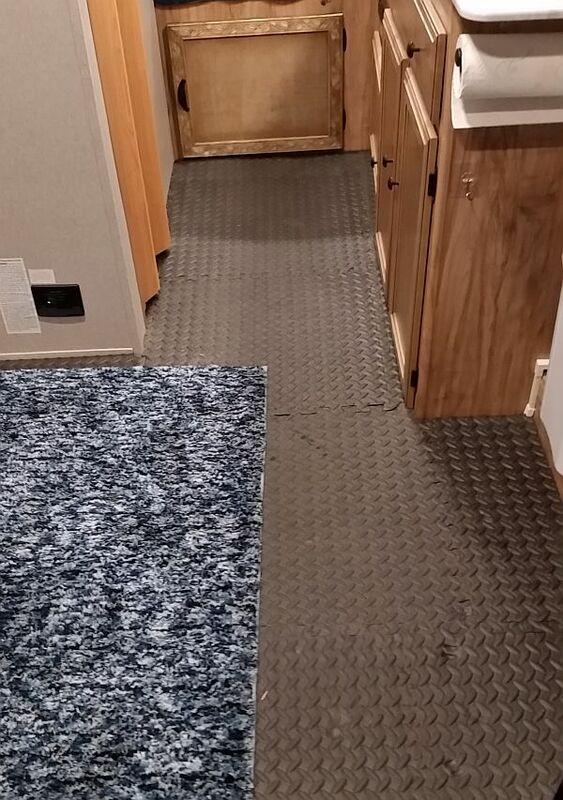 Since we pull the motorcycle in here on some trips we decided to protect the floor with cushioned interlocking mats. 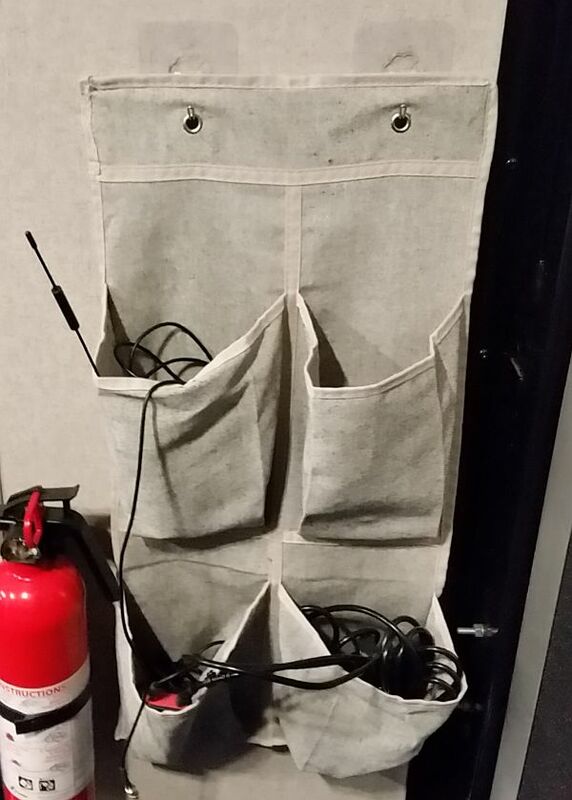 I use these in my shop and they are very comfortable...and they protect the floor. Turns out it is a very good insulator also. We've been in temps in the mid 20's and the mats are not cold...but the floor below the mats feels like an ice cube! Also pictured is one of the two throw rugs Mary added to make it more "homey". 20. Mary has 4 of these self adjusting Spring Tension rods in various place, to keep stuff where she wants it. 21. Above the freezer there was a panel. 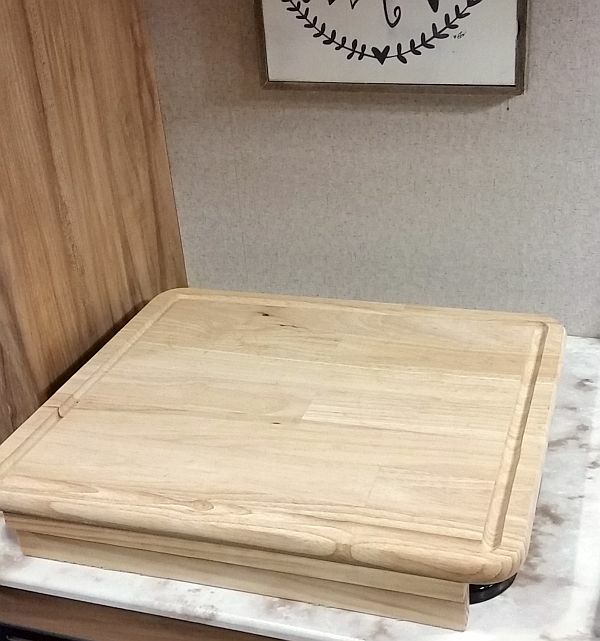 I suspected nothing was behind it, and that we could easily put a shelf there. Well, I was right AND wrong. There was a bunch of empty space, but making a shelf was NOT easy. It was truly a PITA that I wished I never started. Very little room to work to make a supporting frame for the shelf. Will post up more mods as I have time. 22. 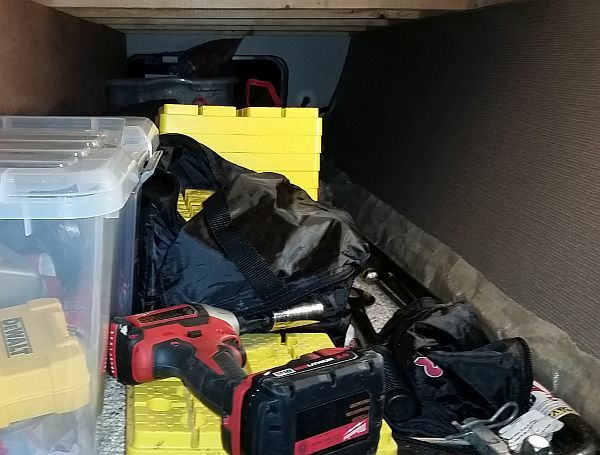 Under the bed is the pass thru cargo area, accessed by cargo doors on either outside walls of the trailer. Also under the bed is the water heater. 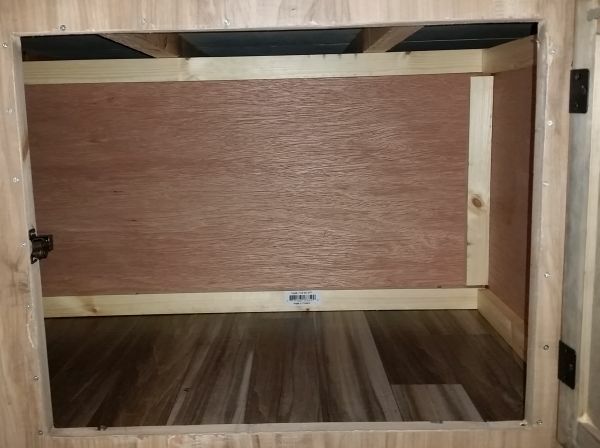 It is enclosed, taking about 1/6th of the space under the bed. We decided we wanted more storage space that was accessible from Inside. So I built two walls, adjoining one of the hot water heater walls. This gave us access to about 1/4th of the cargo pass space from inside, but still left substantial space in the pass thru. 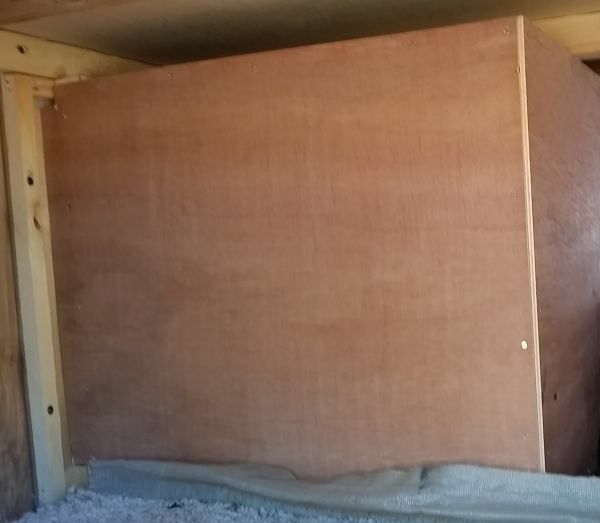 I then cut a hole on the existing inside wall for a door. 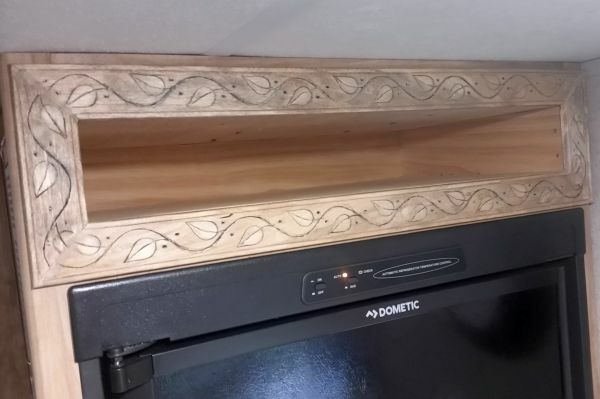 We then made a door from scratch, using luan paneling, other wood and the same decorative molding that was used on the shelf above the fridge. It is a large storage space. 20" deep, 20" tall and 48" wide. In this next photo, the wall seen on the left is where the compartment butts up against one of the already existing water heater walls. This is a view of the outside of one of the storage walls, looking from inside the pass thru cargo area. 23. We put down some carpet in the remaining cargo pass thru space. 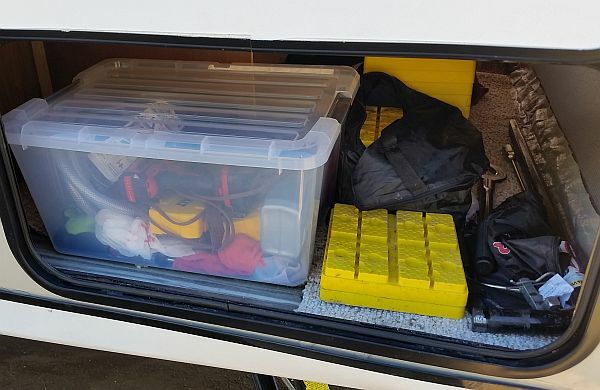 We have our leveling blocks, tire chocks, tools, air compressor, back up battery charger, folding chairs, fresh water hose, filter, pressure regulator, electrical adapters, and misc. other items in here. We are still not using even half the available space. 24. Going back inside. 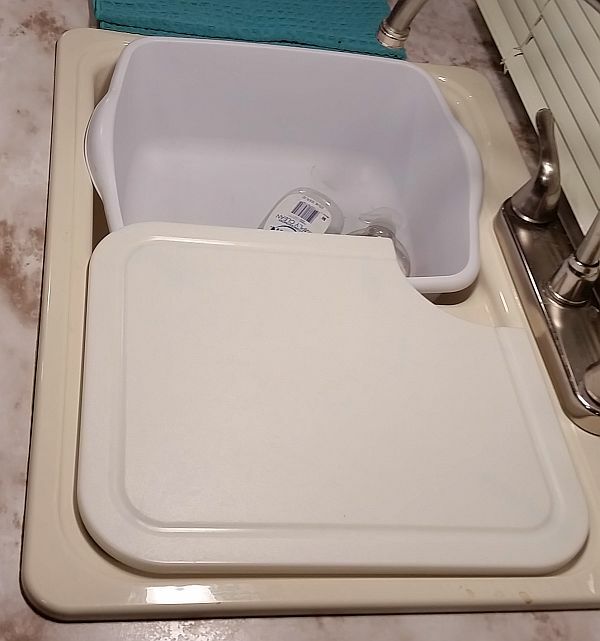 We have a cutting board that covers one side of the double sinks when needed, and a container that fits in the other side of the sink. These are both easily removed when both sides of the sink are needed. However, the container mostly stays in place. 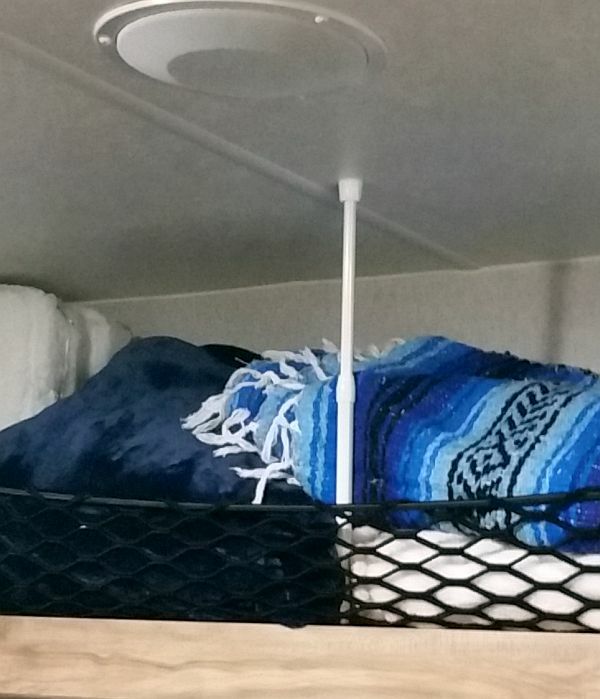 Being as we have been boondocking quite a bit, many times water that is used stays in the container and is then put into the black tank, or tossed outside. We have 49 gallons fresh water, 33 gallons gray and 33 gallons black. Between showers and kitchen the gray would fill up much faster than the black, so we try and even that out a bit. 25. While talking about tanks. 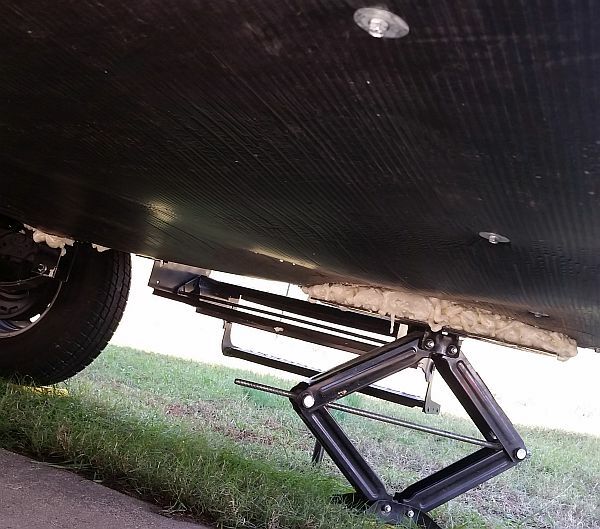 We plan on using the trailer year round, and we wanted to use ALL of the trailer features. So, we knew we had some work to do regarding below freezing temps. First up was unbolting a couple of the fresh water tank support brackets, and then enough of the coraplast underbelly to get to the fresh water tank. The white thing in the photo is the 49 gallon fresh water tank. It was a PITA to get to. After taking this pic I installed a Facon 7 1/4"x25" Water Holding Tank Heater Pad right onto the tank. It was a bit of an irritating job reaching up in there and I completely forgot to take any photo's once it was installed. It has a Built in thermostat, set to turn itself on at 45°F( + - 5 degrees) and turn itself off at 68°F( + - 5 degrees). After installing it we spray foamed all the joints where the coraplast meets the frame and re-attached the coraplast and then the 2 fresh tank support brackets that I had removed. Then did a bit more spray foam to seal up the underbelly. All back together and I hope to never have to replace that heating pad. We've already spent quite a bit of time in temps well below freezing and the tank heater has done its' job well. Coldest we've been in has been 22*. We rarely expect to be in temps much colder than that. Although we have had a few days, where we live, when the temps got down to 10-15 degrees. I expect this will do the job down to those temps. 26. In addition to the tank heater, we had to do some other work on the plumbing to prevent freezing in the colder temps. 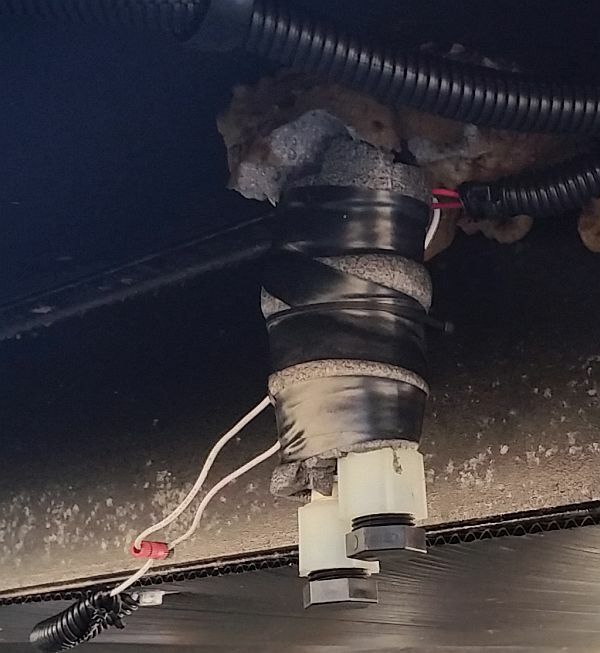 We used some Facon RV Camper Elbow Heater Pads. 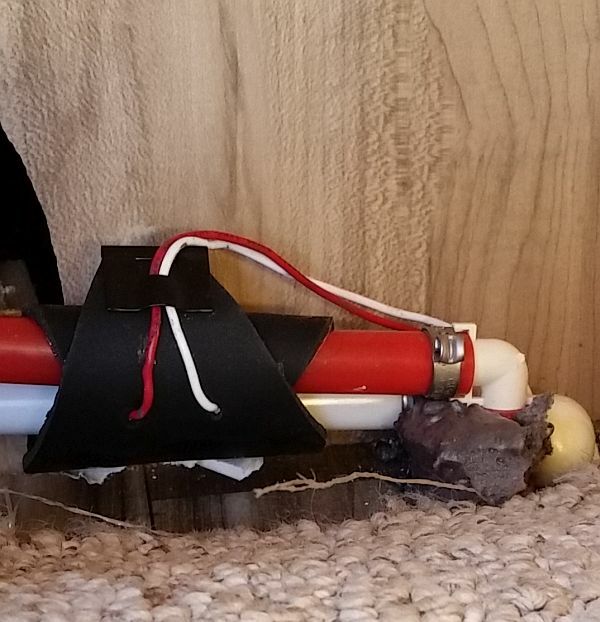 I also wrapped the fresh tank drain with a 3x8 heater pad and then covered it with insulation. This may have been unnecessary since the tank already has the heating pad, but since the drain sticks out in the open, below the belly, better safe than sorry. 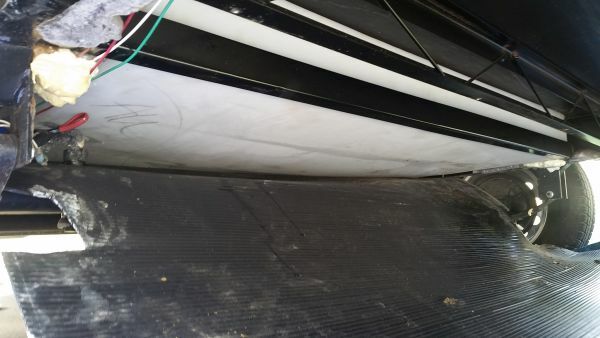 The last place I ran a 3x8 heater pad was around some pipe in the pass thru cargo area. This was probably unnecessary, since the cargo area does have quite a bit of warmth in it from the inside of the trailer. But again, better safe than sorry. 27. I ran all the wires, inside a corrugated wire loom, up to near the batteries. 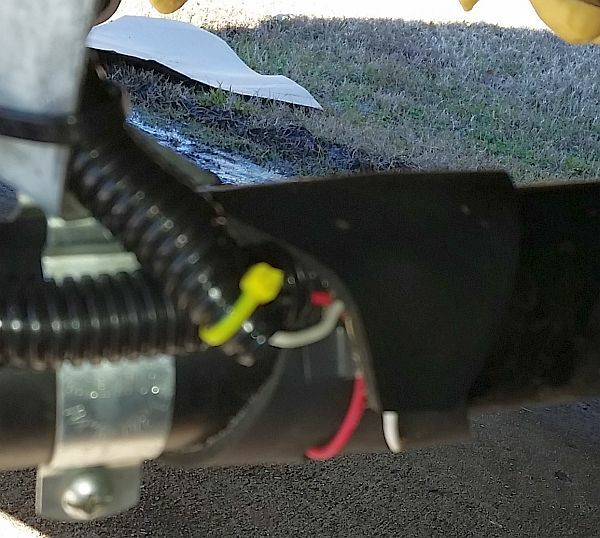 I installed a waterproof 15 amp toggle switch onto the battery frame. I put a fuse between the heaters and the switch, and then wired the switch into the batteries. For extra protection of the switch, I encased the entire bottom of it in Liquid Electrical Tape. I also have an extra one of these switches in with my tools, should this one fail while on the road. 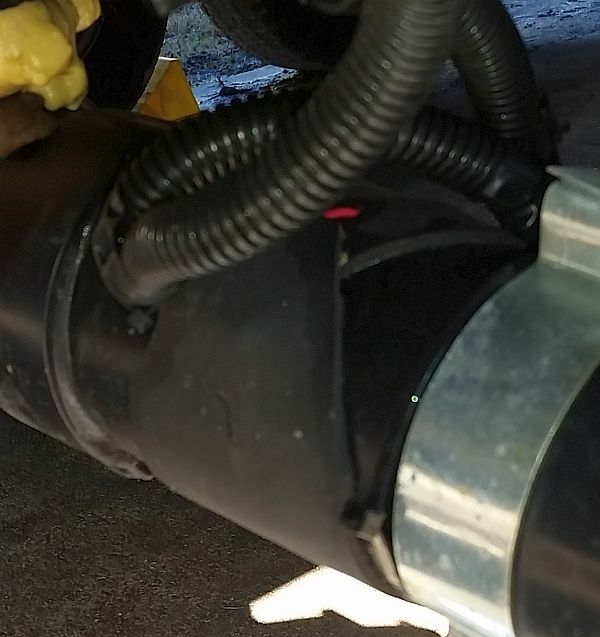 Also, have extra elbow heater pads in with the tools should one fail while on the road. I do Not have an extra tank heater pad. I do need to always remember to toggle the switch on when it is going to be cold. Even though the tank heater has a thermostat and could remain powered at all times, the elbow heaters are not thermostatically controlled. I am thinking about putting an independent thermostat between the switch and the fuses. That way I will not need to remember to toggle the switch when we get close to freezing temps. That's all for now, will post more when I have more time. Been a busy week at the shop, no time to post. 28 & 29. 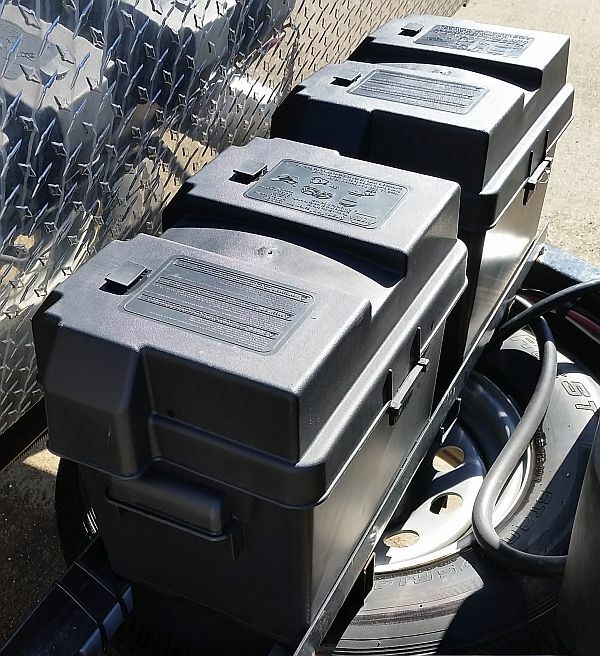 The trailer came with one 12 volt/100 amp hour lead acid battery. 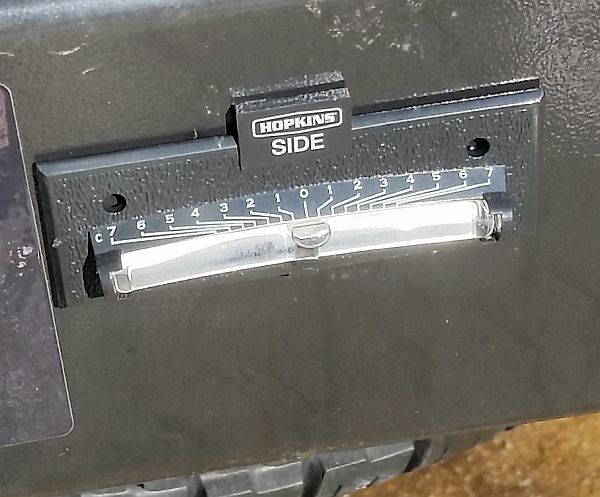 It was centered in the battery tray behind the propane tanks. I purchased a second 12 volt/100 amp hour battery and case, moved the existing one over and put in the second one. 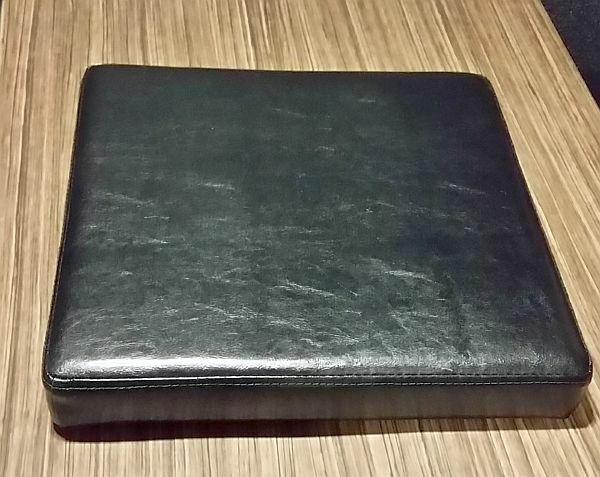 Also, in the photo below, in the lower left corner there is a small white box zip tied to the battery tray. That is the TPMS signal repeater. I thought about adding a third battery to the tray. But wanted to see how we would do with these two first. The two work well. We can easily go 3 days of normal use without firing up the generator or plugging into shore power, just with these two batts. We have used all of the above for multiple days, never dropping below 50%, so I think we're good for now. 30. The first 7-8 times out it was less than optimum with Mary being in the trailer with a level and me being outside getting everything level. 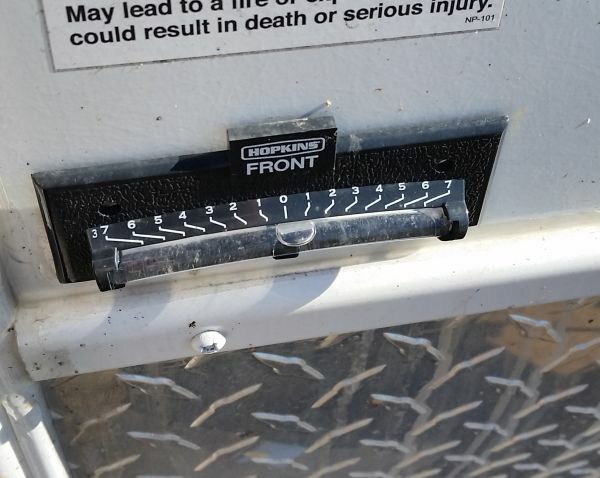 ...and the other is on the front cap for getting side to side level. 31. We quickly discovered that easy access AND Not having the poop tube in a container in the cargo area were both preferable. 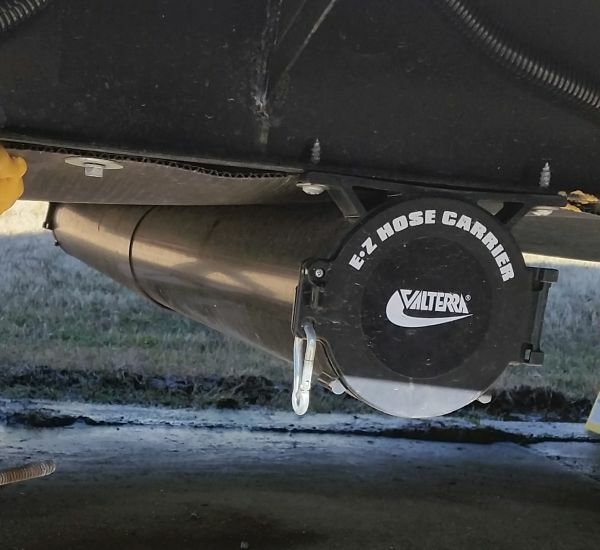 Purchase & installation of a Valterra Products Inc Black 34"-60" hose carrier was easier and faster than making one out of PVC. I did need to spend 20 minutes fabbing a bracket for the far side mount. The unit is not long enough to go from one side to the other. Note: Even though the hinged end caps have a keeper, keeping the ends closed...they are plastic, so we added a carabiner clip on each side. 32. For grins and giggles I had my business partner pull the rig down the road with me riding in it. I discovered that when 55 mph or faster that the pop out window at the front chatters a bit. This is because the wind is catching the leading edge of the window frame and pulling it out a bit, unseating it. It is enough that you can feel a good amount of air moving...and if it was raining, then water into the window frame and inside. 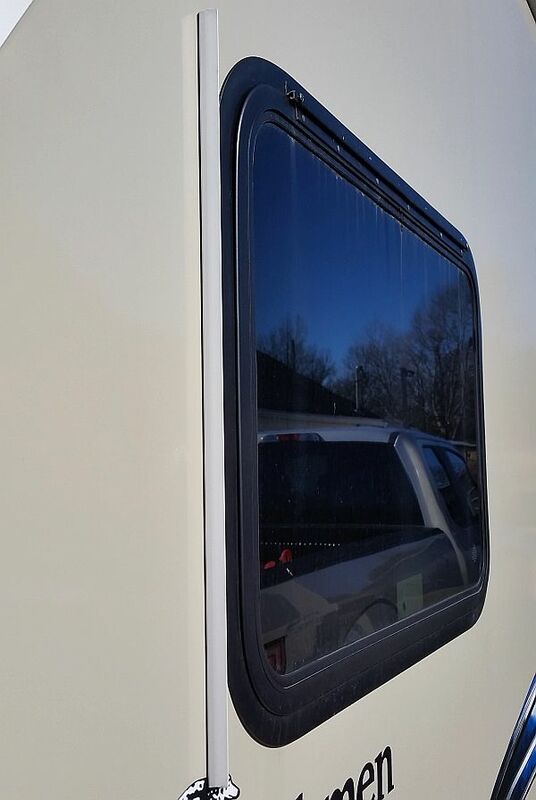 Solution was a bit of trim applied to the trailer side, right in front of the window. Now the air hits that and goes around. No more window leakage at speed. Trim was applied with automotive grade double sided tape...same stuff used to hold emblems on autos and motorcycles. 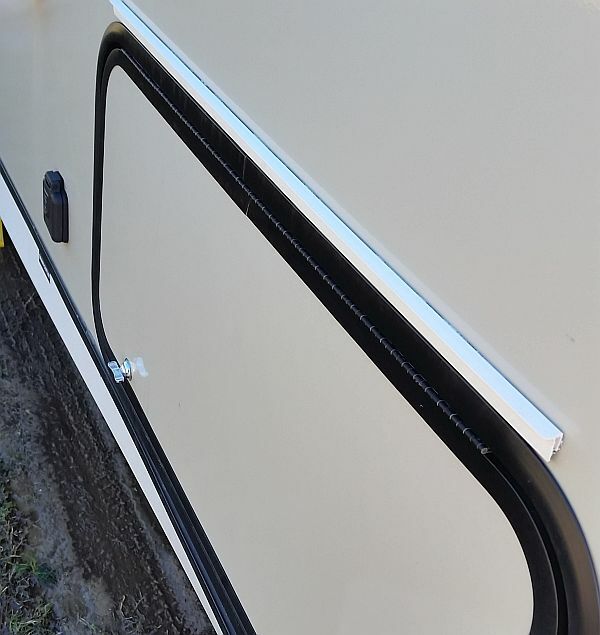 While we were at it we put some of the same trim above the hinges on both cargo doors. Not sure how much protection it affords the hinges...but it can't hurt. 33. 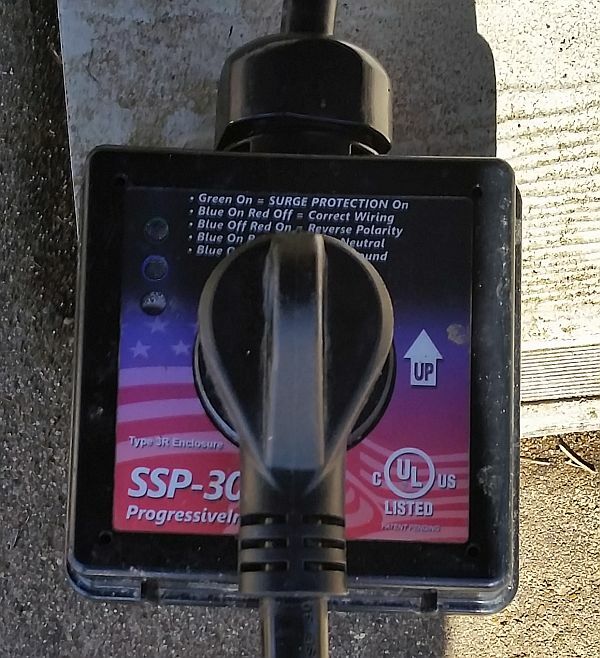 One of the first things we did was get a PROGRESSIVE INDUSTRIES SSP-30XL Surge Protector. It works. Will post more mods soon!